Project obstacles and solutions: The TVA Paradise Fossil Power Plant announced in 2014 that it was shutting down two of its coal-powered generators and was converting to natural gas. 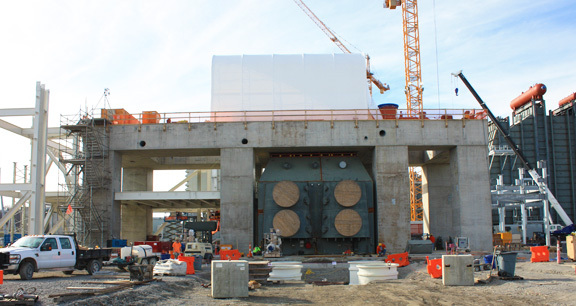 The newly constructed power generator overhaul was awarded to Kiewit Energy Group. Construction began on the new plant in the spring of 2015. IMI supplied 50,000 yards of concrete for the mass pours on the Paradise site. This included 8' foundations for the new generators, walls, pillars and caps. In a mass concrete pour, there is a concern that the internal temperature caused by the hydration of cement will far exceed the external temperature of concrete and cause thermal cracking. This is greatly influenced by the ambient temperatures. The core temperatures could not exceed 90 degrees of the ambient temperatures. IMI QC/QA used a high ash mix to reduce the amount of Portland cement in the concrete, along with a super-plasticizer to control the water content of the mix. IMI also mixed concrete with chilled water and ice on the warmest days of the summer. Operations and drivers also delivered concrete during the night when the air temperatures had cooled down. The other critical part of pouring mass concrete is air entrainment. Since the TVA Paradise plant is in a remote location, IMI used both their Central City and Madisonville plants to supply the large pours - a distance of 12 and 42 miles respectively. IMI QC/QA added hydration stabilizers to control the slump in the mix as it traveled to the job site. Drivers had to be aware of the number of rotations each batch was given prior to pouring. IMI QC/QA field staff tested the air as concrete was delivered and worked with the TVA, Kiewit and a third-party testing firm to ensure that the mix was to specifications. IMI supplied up to 170 yards per hour for these large pours. The new Paradise gas powered generators are to be operational in 2017. For more information on mass concrete pours, controlling thermal cracking, or air entrainment in concrete, contact the sales representative nearest your location. Click here.